I did it! I am so excited. I found the Kanistanaux family in the 1870 Census. So nice to locate this with almost everyone here. The only ones missing are Eli & Catherine Moulton. It certainly would have been nice to find them here too. Everyone, including Isaac, is found using the Kanistanaux surname here. But 4 years later, Isaac went back to Kiness when he purchased land in Stockton. This may suggest a transitional time for the new surname, where they are actually using both names depending on the circumstances. Marleah is probably using her birth name and here she is with the occupation of Physician. This is the first public document I have found that provides her occupation and confirms that Marleah the Doctress in the newspapers is the same person as Mary / Marleah Kanistanaux. Does finding Marleah with Laton and the kids in Rathbone in 1870 mean it is not her with U-ta-wa-un in Rondout the same year? Not at all. I have no way to know if she was actually at home on the day the census taker visited. Plus, the census taker in Rondout visited on July 13th and in Rathbone on July 26, so she certainly could have been in both places. Leonetta is here at age 24. This puts her birth year around 1846 and matches with the older woman. It does not appear she is married to Isaac yet and she does not appear to be practicing medicine yet. I can look for a marriage record between this census in June of 1870 and June of 1874 when they appear in Stockton as a married couple. My search should start in Pennsylvania then move to New York. Canada is also a possible marriage location. Of course if they are traveling around, they could have been married almost anywhere, but at least I now have some idea of when and where to start. I really don’t trust this census taker too much. I see lots of questionable entries on his part. The census taker shows Laton as Indian, but his brother Isaac as white. All of the kids are Indian except Henry. What’s up with that? Henry and Carrie are shown “at school” for an occupation and the box is marked showing they have attended school the past year. Thirty-five year old Isaac is also “at school” but he has not attended within the past year. I have to assume this is an error on the part of the census taker, probably when he copied his field data onto the forms to be submitted to the government. This census suggests there may be only one Lee-o-netto after all. The younger one would be 1 or 2 years old in this census and surely should be found with her mother. I will wait a while before I merge the two in my master data base, just incase I discover more data to add more confusion to the issue. I still can’t wrap my head around the idea Leonetta lost 20 years in age as she got older and got away with it. I know women don’t like to give their real age, but this one seems too far out of whack to be believable. Although this census puts Leonetta within the family, it still does not answer any of my questions about the kids and who belongs to who. Laton is only 13 years older than Leonetta, so he is clearly not her father. Leonetta is 20 years younger than Marleah, and ages suggest she could not have the same mother as Marleah, so my theory that Marleah is her mother or cousin is still valid. There is 11 years difference between Leonetta and Carrie, suggesting (if they are really sisteres) there may have been other children in between that are not living at home or have died. There could also be 2 different families represented by the children. Marleah could have had more than one husband before Laton with a gap in child bearing between husbands. Leonetta is clearly not old enough here to be the mother of Carrie or Henry. 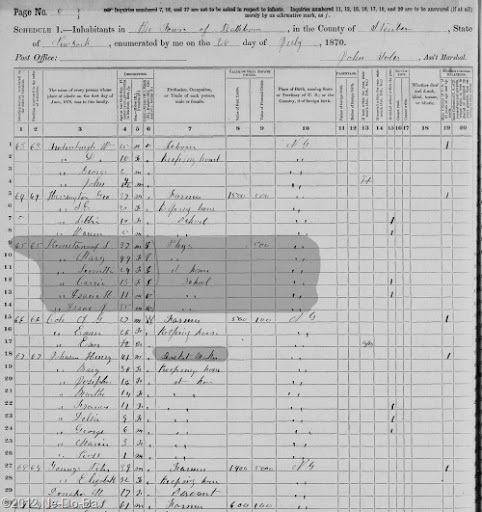 I wonder if the order of the children listed in this census is a clue of some sort? Census takers generally list kids in order of birth, but this is not a rule, just a rule of thumb. The two girls are listed then Isaac Henry after them. Is this an indicator that Henry has different parents than the girls? Both Henry and Isaac are listed as white while all the others are Indian. Does this suggest Henry is Isaac’s son? Interesting that everyone in the household is shown as born in New York. I doubt it’s true. Laton does not own real estate. They may not be living in this town permanently, but just renting a place for a few weeks or months while traveling around the region offering their services. I really have no way to know at this point. The majority of neighbors are farmers, which suggests they are in a rural area rather than “in town”. The family has $500 in personal property, which is a significant amount in this time period. Some of their farmer neighbors have thousands of dollars in personal property, but most have $600 or less. Laton’s property could represent medicines but probably not medical instruments, since I have never found any of them advertising as a surgeon. I suspect some or all of this represents equipment needed by a traveling family, such as a wagon and livestock, tents, etc.. I don’t believe personal clothing & bedding, furniture, or cooking equipment are generally included in the amount. The family is the only one on the page labeled as “Indian”, but I suspect the nearby Johnson family may be Indian and perhaps they are traveling together. Henry Johnson is listed as a basket maker. Basket makers are often found traveling with Indian doctors and Indian shows. Of course, not all basket makers are Native. However, Johnson is a rather common Indian surname among the Iroquois and others, including Brothertown. Now, my challenge will be to locate yet another census record covering the family. I wonder if I can find them in New York in 1865. Or perhaps somewhere in Canada in 1861. I can dream can’t I?